Heatseeker, an Irish-bred Grade 1 winner in the US, was put down on Tuesday at the Veterinary Teaching Hospital at the University of California due to injuries incurred in a paddock accident at Harris Farms. The son of Giant's Causeway, who was due to turn 14 on Sunday, joined the roster at Harris Farms in California in 2012, having moved from his original base of Hill 'n' Dale Farm in Kentucky. 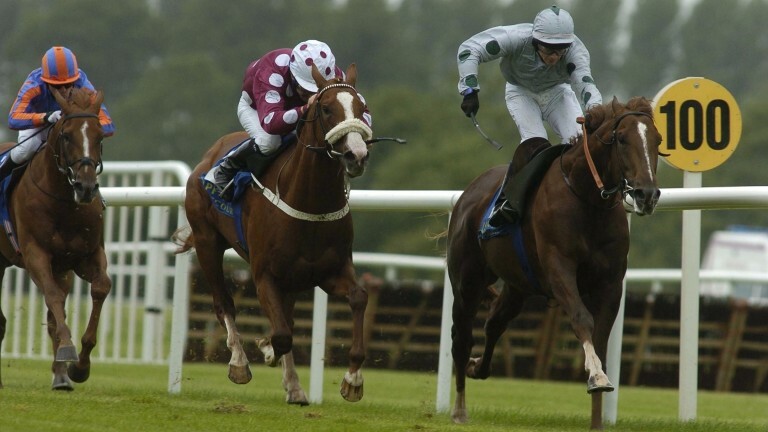 Heatseeker was bred by Rick Barnes of Grangecon Stud in County Wicklow and was trained by David Wachman for Barnes at two when the horse won two races and finished third to George Washington in the National Stakes. He was later transferred to be trained by Bobby Frankel and then Jerry Hollendorfer in America, where he won the Grade 1 Santa Anita Handicap, Grade 2 Californian Stakes and Grade 3 Native Diver Handicap. From five crops of racing age, Heatseeker has sired 189 foals of racing age and ten stakes winners including multiple Grade 1 winner and Peruvian champion Ryan's Charm and Grade 3 scorer Speed Seeker. Heatseeker was out of the unraced Defensive Play mare Rusty Back, a half-sister to Grade 1 winner Spanish Fern from the family of top-level winners Al Bahathri, Haafhd, Hearts Of Fire, Lord Shanakill and Together Forever.